Aqua (Water) (Solvent/Diluent), Glycerin (Humectant), PPG-26-Buteth-26 (Emulsifier), PEG-40 Hydrogenated Castor Oil (Emulsifier), Phenoxyethanol (Preservative), Polysorbate 20 (Emulsifier), Diglycerin (Humectant), Tocopheryl Acetate (Antioxidant), Potassium Sorbate (Preservative), Carbomer (Stabiliser/Viscosity Modifier), Xanthan Gum (Viscosity Modifier), Parfum (Fragrance), Disodium EDTA (Chelating Agent), Triticum vulgare (Wheat Germ Oil) (Emollient), Citric Acid (pH Adjuster), Sodium Hydroxide (pH Adjuster), Citronellol (Fragrance Ingredient), Alpha-Isomethyl Ionone (Fragrance Ingredient), Linalool (Fragrance Ingredient), Geraniol (Fragrance Ingredient), Limonene (Fragrance Ingredient), Citral (Fragrance Ingredient), Benzyl Alcohol (Preservative), Eugenol (Fragrance Ingredient), Farnesol (Fragrance Ingredient). This is just one of products I always replace when empty and don't tend to look for an alternative as more that happy with this one. I am baffled by the other reports of this product describing it as creamy and a runny gel?!! It is a liquid - they do produce a few products in similar bottles though as they make a cleanser which is creamy which I don't like as much and a neck gel - I am wondering if packaging has got mixed up somewhere in the production line as they all look similar? 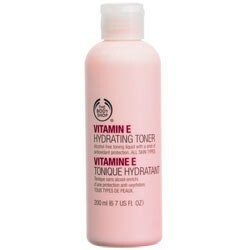 The Toner is my favourite product in the Vitamin E range from the Body Shop and altohough I have tried the cleanser and neck gel they are a bit greasy for my skin! A really gentle product that is kind to your skin, I find it really good removing excess make-up especially the remains of mascara as is so gentle around the eyes. It lasts for ages so good value for money. Not tested on animals either! 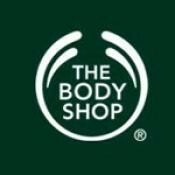 I love this product and the gentle scent - it is really kind to my skin and so I have been using it for a couple of years now and will continue to do so. It makes my skin feel really soft and clean and is suitable for all areas of my face which is combination - unlike some other products. I first thought there was something wrong with mine as it was more like a cream, but I checked the site and this is how it is supposed to be. Although it is creamy, it works really effectively at giving a really deep down through cleanse that gets out every impurity on the skin. It actually leaves skin deeply moisturised and tightens skin but not in an awkward way. Brilliant toner and I highly recommend this if your skin is irritated by watery toners. Gives skin a dewy look to it which is really great. This is one of the strangest texture toners I have ever used. I had a beauty bag with the vitamin E range and this is my least favourite product of the whole range. The toner comes in an attractive light pink bottle with practical flip top lid for easy dispense. It contains vitamin E, wheat germ oil and castor oil to nourish, protect and moisturise the skin. The toner has a subtle rose fragrance. When I first dispensed this product I was shocked at the texture. It is more of a runny gel than a fluid and when applied to the skin I wasn‘t keen on the slimy feel that it left. Toners are designed to remove the last remnants of your face products and although this does a fair job of removal, due to its texture I didn’t feel that it sufficiently removing the last of my products. You skin certainly feels soft and moisturised after use but for me this product felt more like a cleanser than a toner. "This is just one of products I always replace when empty and don't tend to look for an alternative as more that happy with this..."